If he could run just one last marathon, 74-year-old Hans Thamhain says, it would be Boston. But given Thamhain’s resume, tomorrow’s event will likely be far from his last. As the oldest member of the Greater Framingham Runners Club, he has run the Boston Marathon almost every year since 1980, missing only two installments. It’s a mighty impressive feat. But then again, consider Wellesley’s Emilio Rotondi. In the Patriots Day tradition, nearly 27,000 runners are expected to line up in Hopkinton for the 115th running of the Boston Marathon. More than 5 percent of the race field will be at least 60 years old. They no longer run like the wind — and some admit they never did — but in many ways, these veteran runners represent this legendary race as much as Heartbreak Hill or the rich history of its champions. Like Thamhain, Rotondi started running later in life, when he was 32. 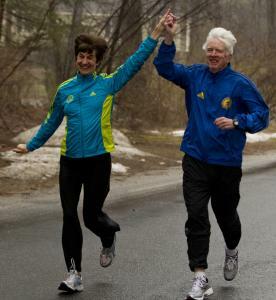 It’s a similar story for Sudbury residents Michael and Betsy Gonnerman, who at ages 68 and 66, respectively, are the oldest active members of the Heartbreak Hill Striders running club. In the mid-1970s, when the couple lived in Washington, D.C., Michael was intrigued by a story about the inaugural Marine Corps Marathon. It prompted him to train to run in the race the following year. “Watching me run got Betsy to start running,’’ he said. Orchestrated by the Boston Athletic Association, the race has grown exponentially in the last two decades, more than tripling from 8,686 runners in 1991 to 26,872 this year. The number of runners over 60 has jumped even more dramatically. In 1991, there were 164 runners older than 60, less than 2 percent of the field. This year’s number is nearly nine times higher, at 1,455. “There’s nothing like training on the course,’’ said Betsy, a hospital social worker. The couple, married 43 years, moved to the Boston area in 1978. Betsy didn’t run a marathon until she was 58, but qualified for Boston in her first attempt with a time of 3:51. However, her first Boston experience in 2005 was disastrous, and she dropped out at the 17-mile mark. The following year, her legs again buckled at Mile 17, and the same emergency medical workers met her. Last year, the Gonnermans ran together the entire 26.2 miles, and finished hand-in-hand in 4:18:23 (good for sixth place for Betsy in her age category). “In fact, our kids were following us on the BAA’s athlete tracking system, every 5 or 10K, and they thought I was wearing two chips, one on each shoe, because we both had the same times,’’ said Michael, who completed his eighth Boston last year. Two constants among these older runners are gratitude for good genes, and commitment to good training. The responses vary when you ask these runners their goals for this year’s Marathon. They know they will never be as fast as they once were, and Boston isn’t designed for personal records. “It’s a tough, tough course,’’ said Betsy Gonnerman. Even Rotondi, who twice ran it in 2:39, his personal best for the event, and qualified for his age group with last year’s time of 4:23, says he isn’t making predictions. Thamhain, who once ran a 3-hour marathon, said earning his age-group number is reward enough. “I’m usually happy if I come in about mid-point or better in my group,’’ he said. Thamhain expressed a similar sentiment. “Running is not my career, just my passion. So, I’ll continue racing as long as it’s fun,’’ he said. “The idea is to produce endorphins, not necessarily records. When I can’t ran marathons anymore, I’ll settle for shorter distances. When? I really don’t know. Ask me again next year.